Students will be drawing a sweet treat with a heavy filling of math integration. Educators will heavily rely on the integration of third grade math curriculum, the Common Core State Standards, and the National Art Standards to help students create a piece of artwork inspired by the artist Wayne Thiebaud. Identify and describe different types of angles, including right angles, actuate angles, and obtuse angles. Understand and use key terms related to angles. Use math vocabulary to describe lines. Understand the relationship between pairs of lines. Recognize the properties of lines and line segments. Use Art History as a means for inspiration in an art piece. 1. 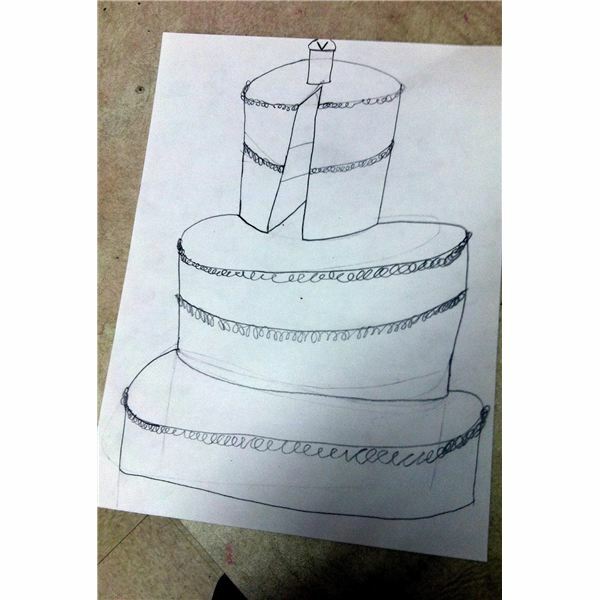 Students will be introduced to the work of Wayne Thiebaud, specifically the cake pieces of work. Discussion will be led deeper into how artists create perspective in art, and how it is important to use correct angles for our work to look correct. 3. After the teacher does the line drawing alone the students are encouraged to work at the same time as the educator repeats it including additional resources to help the students. These resources can be printed out and given to students, projected, or written on the board. A sample handout can be downloaded here. 4. Students are then encouraged to add details such as multiple layers, wording, an aluminum foil cake, and a simple black piece of paper for a background. For the art weary, this can be done with simple materials. Crayons and markers lend themselves perfectly to this lesson where precision is necessary. For the art educators, students could delve deeper into this lesson and paint with different color schemes. They could limit their palettes to warm, cool, analogous, or monochromatic colors only. This lesson is easily modified to help those educators who are weary of the messy nature of art class, and is also readily modifiable for the art teacher who wants to go more in depth with art content. The drawing of the forms heavily supports the work that is going on in the general education classrooms’ of the third grade. Teachers can access deeper technology by trying the ‘cake maker’ online and having students do a virtual cake in addition to their art creation. The vocabulary and language integration of the math deepens the understanding for students as it taps into multiple subject areas. The final creation of the treat really sweetens the deal for all parties involved.